Ehmagawd another month has flown by. 1/6 of the way through 2014. Wowyaysocrazy. My dissertation deadline is a looming, brother! Hopefully by my March favourites I will have *almost* finished it… Not that much else has happened in my life, except I know I’m definitely moving on the 1st of July now. What have you been loving this month? Two blushes I have been loving are the Hourglass ambient lighting blush in luminous flush and MAC petal power. I only got petal power a week ago, but I’ve worn it every day single so I included it. The hourglass one is so pretty, & the powder is so finely milled that it looks natural on. Mmm, I love blush. The MAC one is gorgeous and you all need it. 2 other things from MAC – MAC Candy yum yum for the bright lip (always) times, and combined with MAC Era eyeshadow all over the lid. So pretty, this has been a go-to look all month. 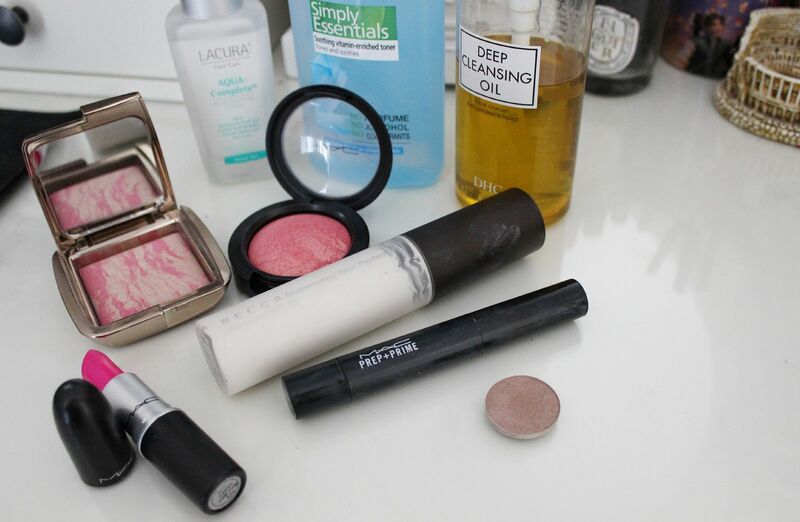 Also in makeup I have been loving smearing the Becca SSP in opal all over my cheeks prior to foundation every day. Serious glow right there. & lastly the MAC prep & prime highlighter in Light boost has been what I’ve been wearing under my eyes. It’s a yellow creamy highlighter that I put under my eyes and blend down my cheeks a la Kim Kardashian. Hmm. For skincare I have been using the DHC cleansing oil to take my makeup off all month. It’s so easy, you just apply it to a dry face which feels a little weird but then massage your face & your makeup melts off. After cleansing I’ve been using the Garnier essentials soothing toner, and I love it so much, it just feels so soothing and calming on the skin. & theeeeen the Aldi Lacura serum has replaced hydraluron and it’s under £4. Awesome.